The Emirates Natural History Group, established in 1977 in Abu Dhabi, has, from its early years, had an association with government departments associated with the interests of the Group and has been recognized for its ongoing work to ‘observe, record and report’ on the natural history of the United Arab Emirates. 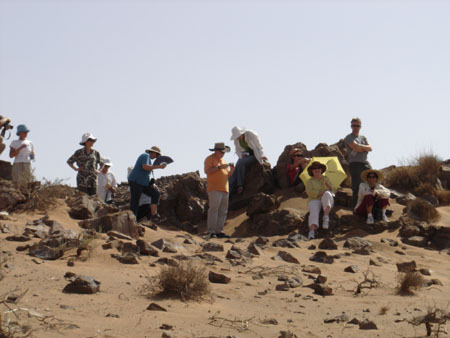 As a non-profit organization of enthusiastic individuals interested in the natural history of the UAE, the ENHG expanded to include a chapter in Al Ain. In the past year, the Dubai Natural History Group, which had for many years worked in cooperation with the chapters in Al Ain and Abu Dhabi, was formally included in the ENHG family. The leaders of the country have, from the outset, been generous supporters of the ENHG and have acknowledged the Group’s contributions. This is most evident in the ongoing sponsorship of Sheikh Nahayan bin Mubarak Al Nahayan. Sheikh Nahayan’s father, with his own lifelong interest in natural history, has been for many years the sponsor of one of the awards presented annually by the Abu Dhabi chapter. The Sheikh Mubarak Award is presented to an individual, or individuals, who are involved in research of natural history topics in the UAE. 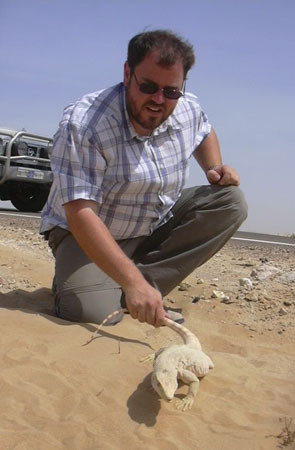 The latest recipient, Peter Hellyer, has been instrumental in the development and ongoing work of the Abu Dhabi Island Archaeological Survey and has edited, written and published dozens of titles on the development of the UAE and its history. Other recipients include Peter Cunningham and Mike Gillett of the Al Ain chapter, the former for his research on the dhub, the latter for his research on insect life. Representatives of the ENHG meet informally with Sheikh Nahayan from time to time to keep him up-to-date on the Group’s activities and ongoing projects. 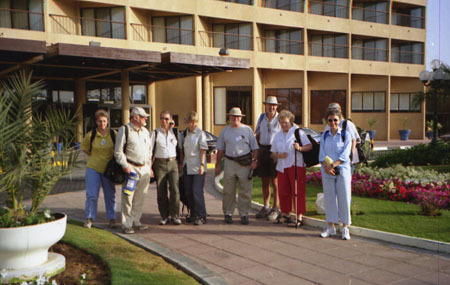 A group of Intercontinental Hotel guests on their way to fossil Valley during the Annual Classical Music Festival. IN ALL FAIRNESS – it is time to thank our generous host – the Al Ain InterContinental Hotel and Resort. Twenty times a year they make a room available for our use during prime time. The hotel offers all the advantages of a conference center, great dining and a balcony overlooking the pool. And if you are an exercise buff – their sports program is full service. It is the atmosphere of success. For our part, by way of real appreciation, we put on tours for their Al Ain Annual Classical Music Festival guests [ see newsletters # 219 & 226 ]. This year’s festival will be held on the second week of March in honor of Wolfgang Amadeus Mozart’s 250th birthday. So come on out and show your appreciation for the hotel’s generosity by visiting the Arabesque, the Tandoor or the Wok restaurants. Luce’s nightclub offers great music and atmosphere. Show your membership card, so they know it’s us! You may not get a discount, but you will be recognized! O b s e r v e – R e c o r d – R E P O R T ! 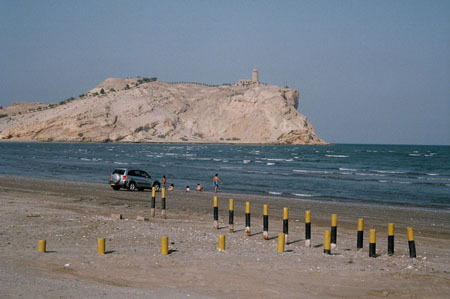 The Al Sawadi Beach Resort Weekend outing was not the usual ENHG activity. But it seemed a good way to really get the program going. 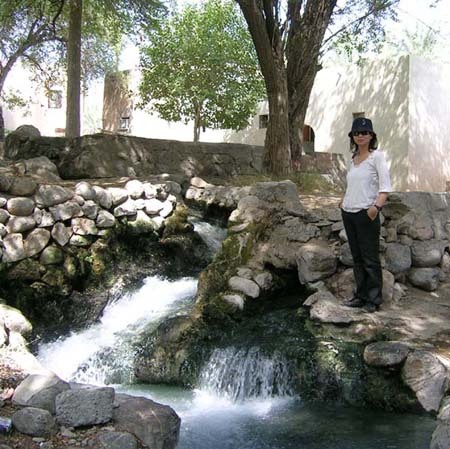 I “discovered” the spot during a one week holiday in mid August and determined that I would offer to organize a weekend trip centred there, with a tour of the Rustaq – Nakhl region as the “natural history” aspect of the trip. I was pleased when twenty people signed up almost immediately – I was overwhelmed when it grew to 50. The Resort staff were really helpful with the reservations. They blocked off twenty-nine rooms, held them for late check-in, gave us a discount on their posted rate and put up with the changes as people discovered they had to work, or had other commitments. 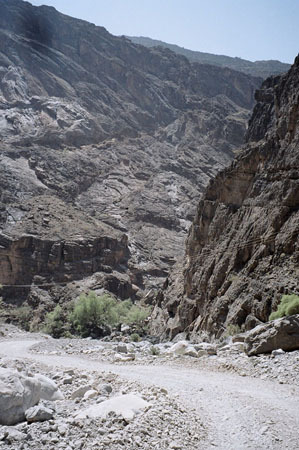 Even the Omani Highways Department co-operated! They removed the construction zone that prevented us from making a left turn off the coast highway onto the side road leading to the resort. This was important, as we would have had to drive ten km further down the highway to Barka then do a U-turn and come back ten km to the same place on the other side of the road. And the weekend itself? A-1 from the initial reports. People arrived at the resort anywhere from 4:00 pm through 1:30 am. 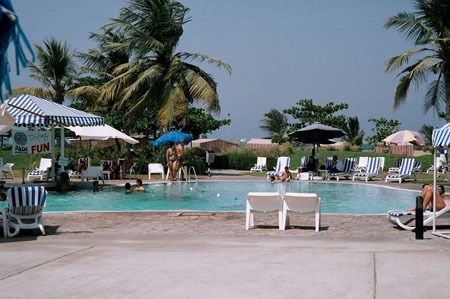 The pool kept all the youth happy and the poolside bar/café kept many occupied. Walks along the beach, Jacuzzis, strolls through the gardens and getting to know new friends also helped pass the time. 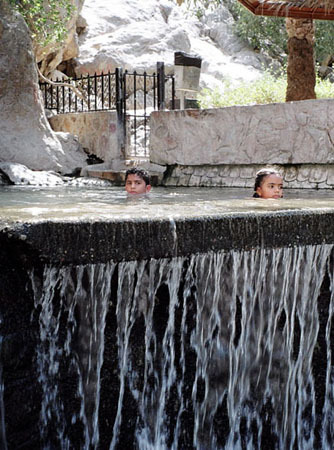 went on to the Rustaq Hot springs “Ayn al Khusfah” which are not really set up for tourists so much as they are for the local population. The main spring is beautiful, but the concrete bathing rooms are small and old. Ruins and modern buildings stand side by side as you follow the falaj downstream. A picturesque rapids stands beneath ancient trees in a small dirt “street” some distance away. For the newcomer it is an eye-opener. The people were all friendly and curious, no one shied away or covered furtively. A forty minute walk brought us back to the spring. 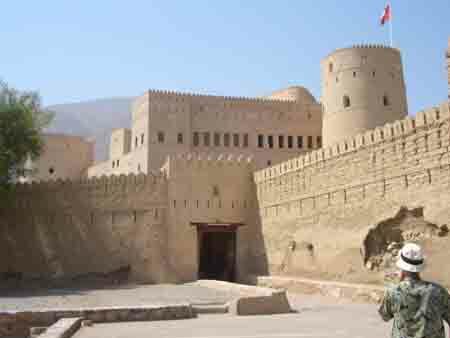 We worked our way through narrow streets to the Rustaq Fort – originally built by Persian Sassanids in the 2nd century CE. * http://www.iranchamber.com/history/sassanids/sassanids.php This fort is very impressive, especially the circular prison with the hole in the ceiling entry (a new door has been added for tourist convenience). 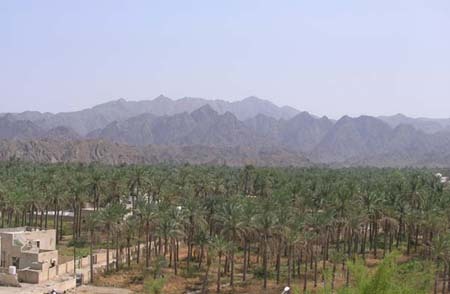 The view from the top reveals the vast extent of the Rustaq oasis. And of course the backside of Jebel Akthar looms high above everything. 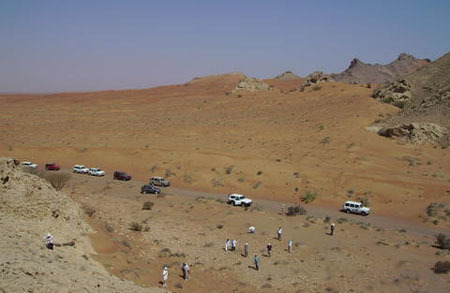 Some members drove the Ibri R/A to wadi Bani Awf 4x4 track through the mountains. Spectacular was the adjective I heard. Drive time was about two hours. And there are other opportunities to venture deep in to the mountains here. Future trips perhaps – hmmm. on. The fort is small and has been renovated. 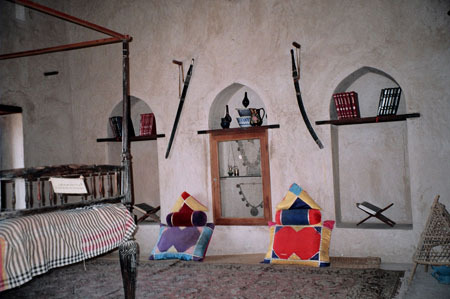 It has an excellent vintage gun display and each room is outfitted with excellent accoutrements – four- poster beds, carpets, wall hangings, dishes and other things are tastefully displayed. 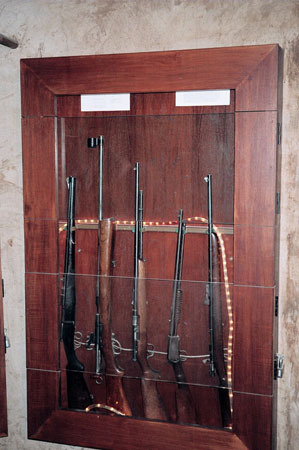 The classic gun collection is stunning, complete with all the accoutrements necessary for making ammunition, this room is a must-see. Bougainvillea and other flowering bushes adorn many walls as you drive further in to town, the “Ayn Ath-Thawarra sign guides you to a small riverbed where children play in the pools. Further up the creek is a parking lot with small shops selling food and coffee. 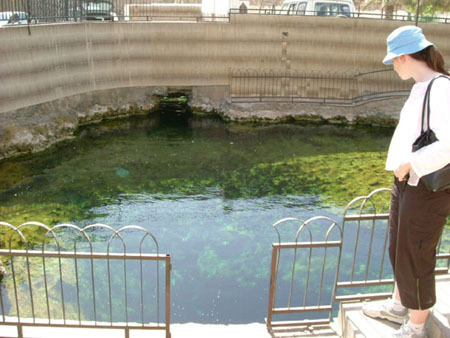 The Nakhl hot spring is one of the best I have seen. The water is nicely warm, plentiful and sweet (no sulfur smell). There is a picnic area with sun shades, tables and benches. Families picnic in the shade of the trees overhanging the creek. 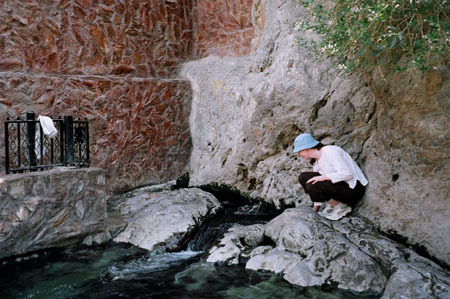 The spring itself gushes from a hole in the base of a large house-sized rock. This stop is well worth the time. Many of our number took advantage of the boat tours offered by the PADI Dive shop. They are still raving about the clear water, the multitude of species, the tiger shark, the… This is a full service PADI operation, It is linked to resort website at www.alsawadibeachresort.com - check it out. 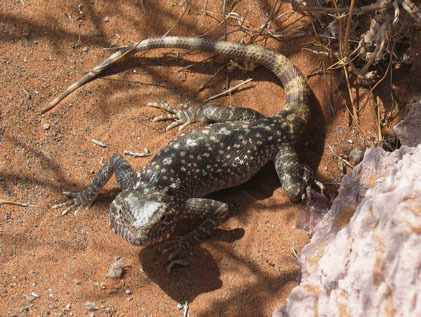 Though not as glamorous as the sand gazelle or as endangered as the Arabian leopard, the native desert lizard, or dhub (Uromastyx lepteni), was the subject of a determined rescue program undertaken earlier this year. The story began when the decision was made to expand the Abu Dhabi International Airport, constructing a second runway and, eventually, building a new terminal building and related facilities. The organization charged with managing the project, the Special Committee for the Abu Dhabi International Airport, or SCADIA, ordered an environmental impact assessment (EIA) before construction began. The EIA, organized by the international firm URS, determined that there was a large colony of dhub on the site and, given the fact these animals are acknowledged as “protected” by the federal government and are a Class II species recognized by the CITES agreement, the decision was made to capture and relocate as many of these animals as possible. Initial estimates were that the colony consisted of about 200 individuals, an estimate that proved remarkably accurate. The animals were spread over a large area of sand and rocky outcrops, between the existing terminal building and the Abu Dhabi – Dubai highway. Initially, the Environmental Research and Wildlife Development Agency (ERWDA, now the Environment Agency, or EA), captured more than a dozen animals and released them on a site west of Abu Dhabi. This pilot project was intended to see how well the animals adapted to capture and relocation. In the course of the project, it was realized that the species were a relatively newly recognized species (U. lepteni) as opposed to the well-known UAE residents Uromastyx aegyptius microlepis. Meetings were held in April and early May as the equipment was assembled to begin the rough grading of the site. It appeared there were only a few days available to capture the animals before the bulldozers moved in. As a result, a rescue program was organized and members of the ENHG chapters invited to send volunteers to help capture the dhubs. For two weekends in May, volunteers set and baited metal live-capture traps and prepared to send captured animals to a temporary shelter in Sharjah. Though almost 30 animals were captured, it was apparent a full-time rescue would have to be organized. Beginning in late May, URS contracted two individuals to conduct the capture. Brien Holmes, of the Al Ain chapter of ENHG, and Thomas Wilems, from Germany, began the process of trapping, identifying and housing dhubs from the site. Thomas was one of the individuals responsible for identifying the U. lepteni species through his research work on dhubs in north Africa and Oman. When the work at the Abu Dhabi Airport began, there were only six specimen (dead) in collections in museums around the world. 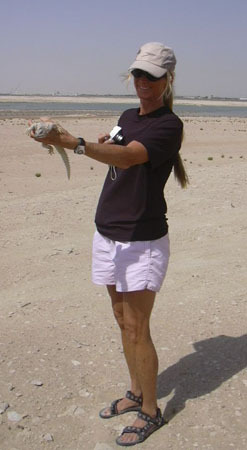 Before the work was completed at the end of July, more than 200 live specimens were collected. Initially, the trapping was conducted using the metal traps provided. However, it was soon obvious that the dhubs were too cunning to be trapped in these relatively large traps. Moreover, the bait being used initially was inappropriate. Watermelon, though a favorite of other desert creatures, is not of much interest to dhubs who prefer grasses and other desert vegetation though, in capture, prefer to eat grated carrots, uncooked red lentils and alfalfa. Eventually, the traps were replaced with simple string snares. Meter-long plastic pipe was placed near the entrance to the burrow and one or more snare loops placed at the entrance. Dhub were captured in the snare either exiting or returning to the burrow. Extra string was used on each snare so that dhub could enter the burrow to escape the intense heat in the event they were snared an hour or more before they could be recovered. The use of snares increased the capture rate significantly and had the additional bonus of allowing the capture of smaller specimen that, because of their limited body weight, did not trip the mechanism to entrap them in the metal cages. During the capture program, records were kept of the air temperature, humidity and soil temperature, as well as the body temperature of individual animals. This provided a considerable database of information about these unknown animals. One very interesting discovery was made in the course of the program. It had been assumed that no animal could survive in the desert exposed to the intense heat once the body temperature passed 40’C. The dhub, with little or not facility for cooling, was presumed to expire once the body temperature was in the low 40’C range. However, several specimen were captured with body temperatures up to 45’C and one with a recorded temperature of 47’C. That individual was still alert and, had it not been captured in a snare, would have easily outrun a predator. Later, tissue and blood samples of some captured specimen were collected for analysis. Volunteers from around the country, and around the world, came forward with an interest in learning more about these unstudied animals. This superb book is the first major book to be published by ENHG, and is a beautifully illustrated account of ‘our’ mountain. We have copies on sale for only Dhs. 100, a huge discount on the retail price. 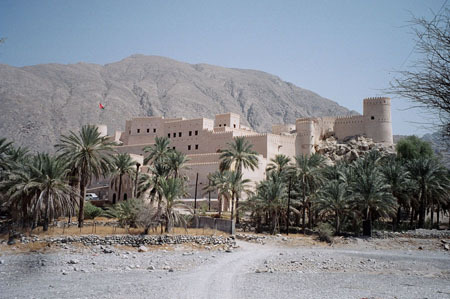 We all know Jebel Hafit, whether as a welcome shape looming up after a long drive up from Muscat, or a distant row of orange street lamps winding up the hill at night. But there is a lot more to ‘our mountain’. This is the most detailed scientific study yet made of the natural history of Jebel Hafit, and was sponsored by ADCO in Abu Dhabi. It is just as informative for the non-specialist. Anyone who enjoys our unique landscape feature should read this amazing book. Then, the next time you drive visitors up to the top for a drink in the hotel or to take in the view, you can impress your friends with your comprehensive knowledge! 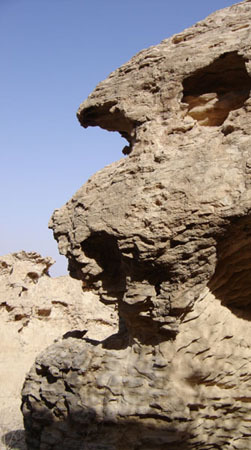 There are sections on the archaeology and geology of the UAE’s only mountain (including the recently-discovered, extensive cave system near the summit), as well as studies of its wildlife. The are specific chapters about its flora, mammals, birds, reptiles and invertebrates, each chapter written by experts including many of our own Al Ain ENHG members. The photos are extraordinary, especially those taken by Bob Reimer - no-one should miss his amazing shot of beetles mating. The maps, including a satellite photo, are clear and helpful. The book lacks an index, but that is in hand. 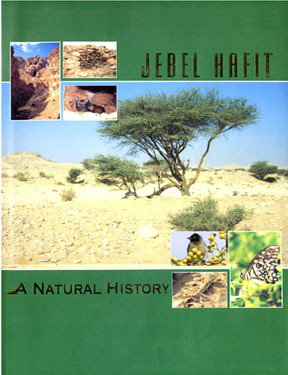 We all hope that books such as this, publicizing the unique habitat of Hafit, might help prevent future developments which intrude on the stark beauty of the mountain. We are really lucky to have the Al Ain English Speaking School (AAESS) recycling site, so please recycle responsibly. Don’t treat the bins as garbage bins – they are recycling bins. The bins are accessible during most daylight hours and into the early evening. If you want to recycle an empty paper box, please flatten it first. If the bins are full, please don’t leave your recyclables beside the bins – bring them back another day. Early in August, 8 ENHG'ers met at the Buraimi Hotel - Friday am at 630. We managed to rearrange into 2 4WDs so we could manipulate the road to the end of Aboul past the fort. We followed the right side of the falaj after a quick survey of the fort ( no mousetail bats now). We ambled out past the graves and 2 possible rock fox traps - one a hole up the left bank. On investigation we found several old running shoes- mismatched- probably stolen by the previous fox resident? We also saw several gravel reptile dwellings. We were accompanied by yellow jacket hornets along the way into the Oasis and back where the workers were busy harvesting dates. 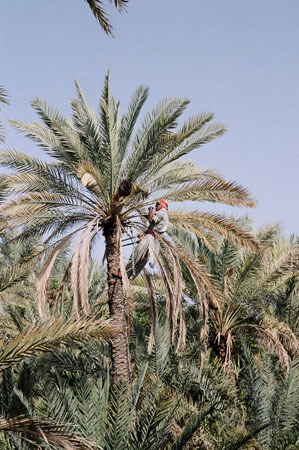 Two were up the palms and others below spread sheets to catch the dates. We also saw lots of lemon trees but were warned by Will of his previous burn from the lemon juice so only sniffed the leaves. It was nice to see the falaj being filled so that the water was diverted to other sections of the oasis. Back at the cars again we waited for the intrepid photographers. Suddenly my foot was on fire! The yellow jacket had stung my toe but I hadn't even spotted it. Oh, it was soooo PAINFULL !!!! I was so glad I had some Rescue Remedy with me but that was all we had. Ice would have been nice to apply too and some analgesic. I bought some Fenestil gel-for-bites at the Al Ain pharmacy but it didn't seem to do much so they gave me Brufen 400. I took some homoeopathic Apis 30 C and that was magic! This also helped another friend who had been stung a few weeks ago on the arm. So, if there is a moral to this story, then " Be prepared" would be it? On all outings a FIRST AID kit should be carried and if possible some ice in a cool box and a book on treatments maybe left in the car. Now I must say goodbye once again to this lovely country and all the enthusiasts who are drawn here. Keep up the good work and see you all again sometime. 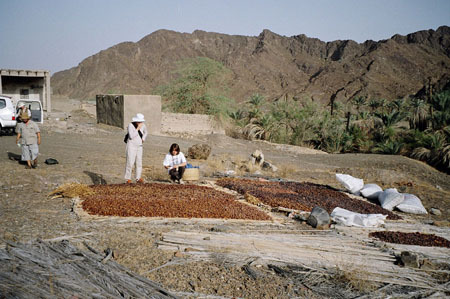 Dates drying on mats – hornet heaven! WARNING! OPEN-TOED SHOES INVITE CUTS, STINGS, AND PUNCTURES! WEAR PROPER FOOTGEAR ON ALL OUTINGS! If you have been on one of our wadi trips, you may have heard my explanation about the dark red varnish that appears on the rocks that provide the "desert armour" on the gravel plains at the foothills of the Hajjar Mountains. For many years, the explanation for the varnish has been some association with microbes which either in the course of their lifespan or associated with their death leave or otherwise deposit some moisture that causes the rocks to be stained and the varnish to develop. 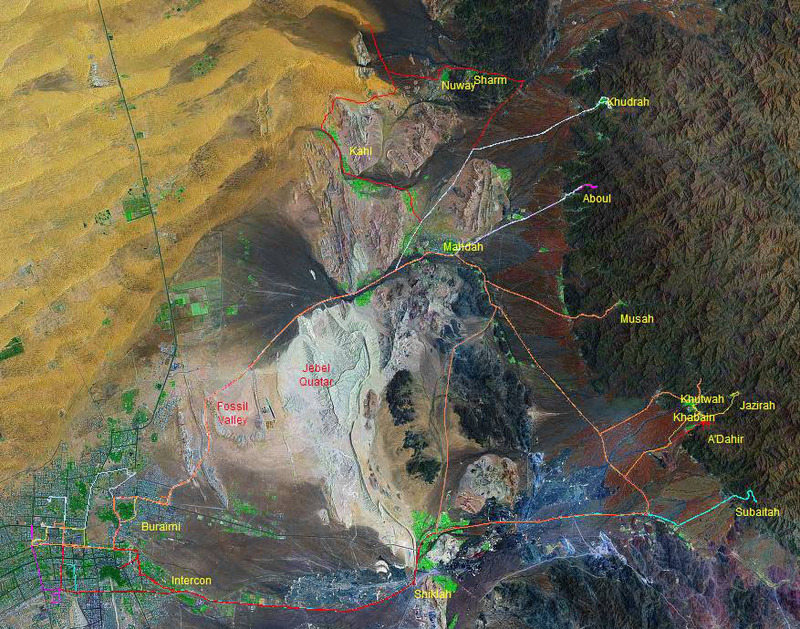 "For years scientists have assumed that desert varnish was composed primarily of manganese and iron oxides, precipitated out of the rock through weathering processes. However, the varnish structure eluded precise analysis because it is composed of particles too fine to be characterized by X-rays, the main diagnostic tool of mineralogical investigation. "Infrared spectroscopy, a technique which illuminates mineral samples with infrared light and records the pattern of absorbed wavelengths, was applied to the study of desert varnish by two Caltech scientists. George R. Rossman, associate professor of mineralogy, and Russel M. Potter, Caltech graduate student, used rock samples from 20 locations in California, New Mexico, and Arizona in the analysis of desert varnish. The samples included quartz, granite, basalt, rhyolite, quartzite, feldspar, and sandstone. "The results of the analysis revealed that the main constituent in desert varnish, totaling about 70%, is clay, not manganese and iron oxides. The oxides form the remaining 30%. The red coating on the underside of the varnished rocks, previously believed to be iron oxide, turned out to be 90% clay incorporating an iron oxide stain, similar to the iron in the black finish on the rocks' exposed portions. In addition it was found that all desert varnish, whether it formed on the side of a cliff or on a 10-inch boulder, shares a similar composition." "History of Study: biological origin proposed in 1921. Recent advances based on electron beam microprobe (Hooke et al., 1979), which demonstrated layering of varnish. "Technique: analyzed by X-ray diffraction (reveals clay mineralogy), infrared spectroscopy, electron microscopy, microprobe, bulk chemical analysis, TAMS dating, isotope analysis." technology provided the means to test the theories. This discussion evolved when Steve was among the members joining us for the tour of Khudrah. On the gravel plain overlooking the oasis, I explained that the dark stain on the "desert armour", the rocks covering the flat surface of the gravel plain, was believed to be caused by some bacterial action. Steve, to his great credit, undertook to investigate the claim and forwarded links to two papers. One, from Caltech, offered an explanation involving clay while the more-recent Arizona paper supports the bacteria connection. The Arizona paper also includes some interesting notes explaining the appearance and color of the varnish. As many of you know, the color here is a dark red which suggests, and Arizona confirms, the presence of iron. light shiny varnish = clay accumulation dominant "
I trust Steve will let me know if there have been any further developments. And, on behalf of the membership, thank you to Steve for sparking the discussion! There are so many things going on now in the natural history group that it is impossible to report on all of them each month. The insect trapping and identification project is one such project. It is coming along nicely according to Dr. Brigitte Howarth, who is now holding weekly meetings at her workroom. She encourages anyone interested in helping with the project to contact her through enhg@yahoogroups.com to arrange a visit. “No expertise is necessary” she stresses. “There are so many specimen to be identified, mounted and labeled that there is something for everyone to do.” The group meets on Saturday evenings at about 7:30. There’s tea, coffee, snacks and good company to enjoy. 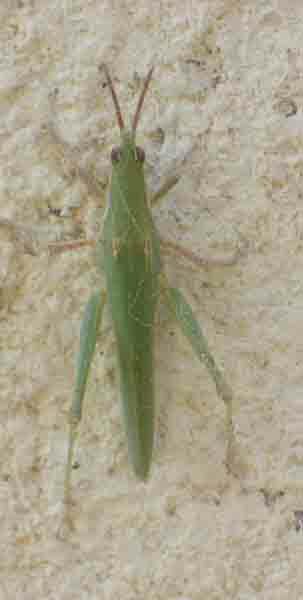 The ENHG is currently in possession of the finest insect collection in the Emirates – if not in the Middle East – thanks to the generous contribution by Mike Gillett, a lifetime member of the ENHG. Brigitte has, in the past, led many insect trapping outings around Al Ain. Sitting around the mercury vapour “moth lamp’ has become the equivalent of sitting round the campfire as she and Bob Reimer identify and photograph important insects attracted by the light. Anyone interested? Perhaps you could help, B? Friday, September 23rd saw 32 people gather outside the Buraimi Hotel for the desert drive from wadi Kahl to Wadi Sharm A distance which could be covered in 20 to 30 minutes by an experienced driver in a hurry, took us about 3 hours. Soft sand is not the same as hard packed sand, dunes are not the same as flats. Long gentle slopes are not the same as short steep pitches – and it is still hot out there. We learned about camels, about their clay rolling areas, about fossils (nice one, Bob) and about the geology of the region (thanks Stephen). We tried out a walkie-talkie system and found it to be an excellent aid – we learned about convoy driving and how easy it is to lose your mates. It was an altogether excellent day. Here are some of the pics people have sent in. Do join us next time. This little guy (almost a half meter long) sat still for the photo and then zipped underground before the rest of us could see him. – So here he is everyone – come look! ENHG members over the years have identified many grave sites and have dated them based on their alignment relative to Mecca – any grave not aligned according to Islamic tradition is pre-Islamic. However, there was a presupposition that the foot to head alignment was the important one, when in fact it is at ninety degrees to this that Islamic tradition follows, because the body is placed in the grave on its side with the face towards Mecca. This addition to our knowledge means we have to go back over all the sites previously identified and re-check their orientation. We learned all this at this grave site along the Kahl – Sharm passage. 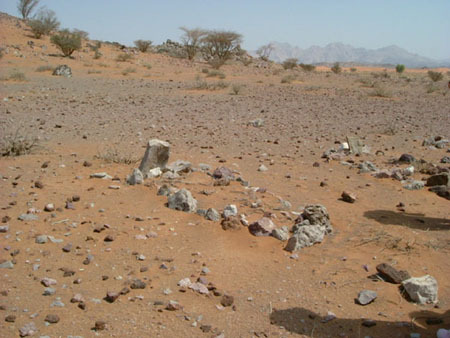 These graves have the usual Islamic headstone, but also have a “ring” of stones around them which is sometimes indicative of Um-an-nar relics. driving skills. So despite the fact that we all had fun, a lot of useful learning was going on. Getting to know your vehicle is a survival skill in this region of the world. So do come on out – join us – and learn as much as you can about your environment – the flora, fauna, geology, and social aspects of it all come in to play on these outings. Get your head out of your work, out of your house and into the deserts and mountains around you. Where is Khal? Sharm? – Khudra? Jazeera? Jabeeb? Do you know? Come on out and find out – in reality! Our thanks go the leaders and assistants for taking the time to share their knowledge and experience with all who show an interest. Without them (and you are them!) we are nothing. of the plants available on the airport site was necessary to ensure the appropriate vegetation would be available at release sites. Later this year, the rescue operation will move inside the security fencing at the airport to capture dhubs, hares and gazelle. Although rare and endangered species have been captured and relocated in various programs around the world, it is believed that this is the first instance of reptiles being the subject of such a program. SCADIA has been so enthusiastic about the rescue program that there are plans to incorporate the dhub population in the final design of the airport, with some of the survivors enjoying a retirement in a special area set aside in preservation for the animals. The ENHG is looking for one or more volunteers to take on maintenance of the resource room and ENHG equipment. We lost both Chris Sanor and Denise Caporelli-Lee last season. This position is unpaid, you get no thanks, no one listens to you, but you do get to drink coffee and have snacks once a month! Any takers? 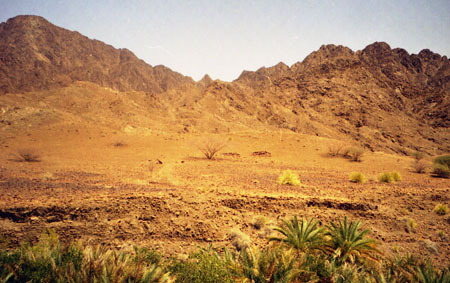 Christmas Eve in the desert – December 24. 9th January to 29 - break. We are pleased to report that Sandy Fowler's "Rough Sheller's Guide to the Northern Emirates" is now available in PDF format from our website. You can reach it through the Contributing Authors section of our home page. Please contact a committee member to confirm your wish to participate. We will gather there around 5:45 for dinner commencing after the call to prayer.